What is RumbleTalk group chat? Do users have to be on the same page to join the chat? Can I create more than one group chat in my account? I want a floating icon, can RumbleTalk do that? Do you chat black word list control? Social: Add an open chat room and engage your audience. Social features cab ve turned on/off as needed. or REST API. RumbleTalk chat room service allows an easy customization, responsive design, simple integration (embed) into any website. Experts: Add an expert chat and talk in private conversation with your audience. RumbleTalk chat is designed for brand communities, live events, panel discussions, academic institutions, online trading, live radio, fan clubs, blogs, connecting with customers, or just chatting with your friends! With RumbleTalk, you'll be able to engage your online community (public or private room) and increase the number of loyal, active consumers who return to your brand time and time again. RumbleTalk works seamlessly on mobile phones, tablets, laptops and personal computers and can be embedded into websites, Facebook and even stand as an independent URL. With just one line of code, you can transform a billboard website into a vibrant online community. Add a video broadcast using "YouTube Live"
A RumbleTalk group chat is versatile and can be embedded in any website as a chat box or floating icon with just one line of code. You can also incorporate your group chat in a Facebook page to capture a larger audience. If you don't have a website, we'll give you a URL to send to your community. The best part? You can choose one, two, or all options and embed as many times in as many sites as you like. Sure! RumbleTalk customers can create multiple group chats. Each group chat can be placed within a single website or on several different websites. You'll be able to purchase number of chat rooms using our premium page. For websites with an existing user base, RumbleTalk can allow user logins using our RumbleTalk Login API. Read more about RumbleTalk Login API here. The chat owner may set private messages to ADMINS only, so private messages can only be send to the ADMIN and by ADMIN. Sure! You can upload most file types including PDF's, Word Documents, Excel Files, PowerPoint Presentations, pictures and more. Yes, RumbleTalk easily integrates into a Facebook page. This means that your online community can bring your website visitors and your Facebook visitors together all at once, making your audience larger and closer. From the admin panel, click on the Facebook button, you'll then be prompted to choose a Facebook page to add your RumbleTalk group chat to. It's that easy. Note, make sure that your Facebook account email and RumbleTalk account email are the same. You sure can. We host the group chat room on our servers so you and your customers can access it without embedding within a webpage. You'll be provided with a URL that can be sent to whomever you'd like to participate in the conversation. The group chat still works the same as if you were going to embed it in a website or add it to a Facebook page, meaning you can still customize all the same settings. We sure can. RumbleTalk group chat rooms can be integrated as a floating icon, just take a look at the bottom right corner of this page! You sure can. RumbleTalk group chat allows you to make live audio and video calls from web browsers that supports WebRTC such as Chrome and Firefox. You can adjust the setting to allow calls for all users or admins only. Live calls option require that the chat will be placed in a secure web page (HTTPS url). We save the transcript based on your preferences. If you choose to keep a conversation private, we will not record or save the transcript. If the conversation is not set to private, the group chat transcript will show in the group chat as users scroll up. This transcript can be exported by the group chat owner into a HTML file from the admin page or directly from the group chat. Also from the admin panel, the group chat owner can select a date range and export the group chat history using the "export archive" option. Sure, as a measure of security to prevent groups of users from spamming the chat (flooding), when they start typing too fast, they are kicked out of the chat with a message stating: "you are typing too fast".. Yes we do. RumbleTalk chat includes a spam filter feature (black word list). It is actually means that we let customers define a list of unauthorized words. It could be curse or a competitor name that is not welcomed in the chat. The filter is filtering words both on Users names and room messages. Does RumbleTalk PayWall chat can be used in all type of sites? How do users pay for their chat sessions? RumbleTalk PayWall is a configurable option allowing you to charge your users a fee for various actions in the chat room. Currently we support PayWall for logging into the chat. 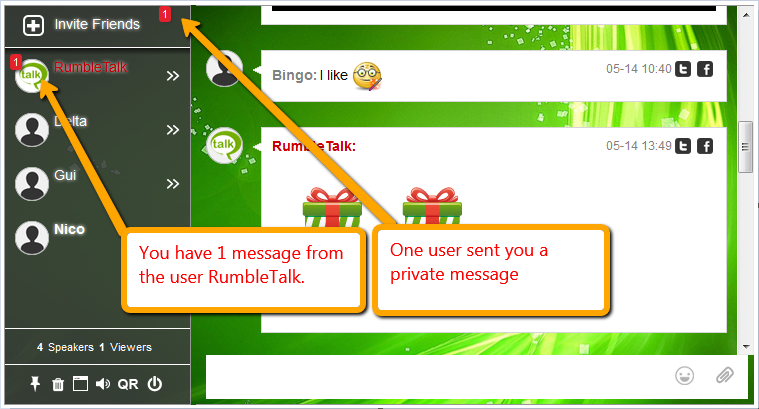 RumbleTalk PayWall allows chat owners to place a price tag on logging into their community chat. The platform allows users to chat, private chat, and video chat with others (or with admins) in the comfort of their own home. RumbleTalk’s mission is to help connect, inspire, and empower communities by bringing conversation and payment to the digital age. Sure! You can add a RumbleTalk chat to your website and set it to be a group chat or a PayWall chat. RumbleTalk group chat can be placed anywhere based on our Terms & Conditions. If you wish to use the PayWall option, there are some prohibited websites/activities. Relate to transactions that (a) show the personal information of third parties in violation of applicable law, (b) support pyramid or ponzi schemes, matrix programs, other "get rich quick" schemes or certain multi-level marketing programs (c) involve offering or receiving payments for the purpose of bribery or corruption. RumbleTalk group chat is purchased with either a monthly or yearly billing cycle. By choosing a yearly billing cycle, you'll receive a substantial discount on your subscription. Absolutely! We've made it so that you can customize RumbleTalk group chat to fit your brand and site. You can even customize both web and mobile versions. We offer a quick editor for easy point and click customization of the web group chat in the Advanced Design tab of the admin panel. RumbleTalk group chats can also be fully customized with CSS in both web and mobile versions. With CSS you'll be able to change any aspect of the chat appearance. Web and mobile CSS changes are done separately allowing another layer of custom design. Yes, every group chat you create can have a unique custom design. For every chat you may change the web and mobile design. RumbleTalk group chats are fully responsive. This means that the group chat will automatically fit within the space available wherever it is embedded. Yes. In the Advanced Design admin panel, switch to the Chat Area tab to adjust all font settings for the group chat. Nope, changes to the design can be made at any time. Once the theme has been saved, the changes are seen by new participants and existing participants after the page has been refreshed. By default, RumbleTalk group chat supports invisible observers: those who watch the conversation unfold without logging in. However, this feature can be disabled in the admin panel, if you wish to ensure users log in to see the conversation. RumbleTalk group chat currently supports 36 languages, see some of them in the list below, for the user interface. If your language is not shown, no problem! You can send us a translation and we'll add the language. Instructions for suggesting a language are given in the Chat Settings tab of the admin panel. Can RumbleTalk integrate with WordPress, Wix, Joomla, or any other 3rd party applications? Yes. You can appoint moderators, called "administrators", from the admin panel. Group chat administrators are able to delete messages, disconnect users, and ban users. Yes. Administrators have the option to delete individual messages and all messages at once. >Each user’s group chat profile will be populated with the information they chose to log in with. Yes, yes, yes, and yes. RumbleTalk uses IFrames to have near universal support in third party applications. Some CMS applications such as WordPress, Wix, and Joomla have RumbleTalk plug-ins for easy integration. If you're not using one of these applications, we'll give you one line of code that can be placed in any website to instantly open your RumbleTalk group chat. Not familiar with code? No problem, we have a support team ready to help. Contact support@rumbletalk.com. Some outdated browsers may experience problems when loading RumbleTalk. Try using a modern browser such as Chrome, Firefox, Safari, or Microsoft Edge. In some cases, you may be behind a firewall that is interfering with your access to your group chat. To fix this, speak with your IT department or system administrator. Still having issues? Contact: support@rumbletalk.com. Do you offer the chat for free ? Yes! Anyone can try RumbleTalk for free. Add it to your site and get started chatting with up to five chatters. When you need more chatters or more features, you may upgrade to a full feature plan, you can do so from the admin panel or from the premium plans page.